Ethiopia Protests: FILE - In this June 10, 2005 file photo, members of the Ethiopian army patrol the streets of Addis Ababa, Ethiopia, after recent clashes with protesters. Violent weekend clashes between protesters and security forces have claimed the lives of more than a dozen people across Ethiopia. The government announced Sunday, Aug. 7, 2016 that seven protesters died in the northern Amhara region's capital, Bahir Dar. As protests continued to engulf parts of Ethiopia’s Amhara and Oromia regions this month, citizens have been shaving their heads as a sign of solidarity with jailed opposition leaders. People posted videos online of themselves shearing off their hair with electric razors in response to a letter smuggled out of prison by Oromo political leader Bekele Gerba and others. In some Ethiopian cultures, a shaved head is part of the mourning process after the death of a loved one. “They’re calling for mourning for those who are martyred, for visiting those who are in the hospital and to pay a visit to the families of the martyrs,” said Jawar Mohammed, executive director of the Oromia Media Network, a dissident satellite TV channel based in Minnesota broadcasting into Ethiopia. They're also pleading with the government and the international community to stop what he calls the "mass murder" of people. Human Rights Watch recently reported that more than 400 people have died since the anti-government protests started in Oromia last November. 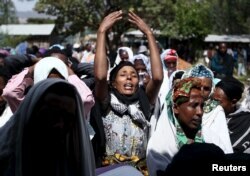 At least another 100 people died during another round of clashes between police and protesters earlier this month. 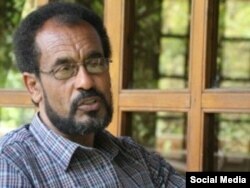 Gerba, a former lecturer at Addis Ababa University, has been active in Ethiopian politics since 2009. He is a proponent of Oromo rights and a critic of Ethiopian government land policies that have pushed farmers off their land. Gerba was imprisoned for the second time on December 23, 2015 under the country’s anti-terror law and charged with supporting an Oromo armed rebel group, an allegation he denies. He had been arrested in 2011 for meeting with Amnesty International researchers and released in 2015. In July, Gerba went on a hunger strike to oppose the treatment of Oromo opposition leaders at Kilinto prison near Addis Ababa. Gerba’s lawyer alleges that leaders of the Oromo Federalist Congress party are being kept in squalid conditions, with limited access to their families. Gerba’s imprisonment and his calls for peaceful protest have given him almost an iconic status. When protests spread from the Oromia region to the Amhara region in recent months, some protesters in the Amhara region were holding his picture and calling for his release. This has led some to view him as a unifying figure between the country’s two largest ethnic groups. “He is an Oromo and he represents an Oromo political party but he … didn’t want to divide and create a wedge between the two communities,” Mohammed said. Leaders from the two communities have been trying to narrow the gap between them in public and in closed door negotiations both within Ethiopia and outside the country, Mohammed added. FILE - Women mourn during the funeral ceremony of Dinka Chala, a primary school teacher who family members said was shot dead by military forces during a recent demonstration, in Holonkomi town, in Oromia region of Ethiopia, Dec. 17, 2015. Ethiopia’s ruling party, the Ethiopian People’s Revolutionary Democratic Front (EPRDF), met over the weekend to discuss protests and issued a statement giving an overview of progress made in the past 15 years. The government continues to maintain that peace and security have been restored across the country and its actions in response to protests have been measured and justified. Officials have said only those involved in criminal activities or violent behaviors have been arrested. Government spokesperson Getchew Reda has rejected recent calls by the U.N. for independent observers, saying Ethiopia will launch its own investigation. However, Mulatu Gemechu, the deputy chairman of the opposition Oromo Federalist Congress, said this is a matter that needs the intervention of independent human rights groups.